gal·li·mau·fry (noun) 1. a confused jumble or medley of things. I taught my first class at Bard on Tuesday night. It was slightly nerve wracking, but the 14 people who are listening to me burble about writing and fantasy seem very nice and relatively forgiving, and I'm looking forward to doing it again tomorrow night. Only, I hope, saying different things. There aren't any more events in New York this year that there are tickets for, except for THE TRUTH IS A CAVE IN THE BLACK MOUNTAINS at Carnegie Hall. (At which I think I will also do the first reading of the whole of Hansel and Gretel as well.) Lots of people are asking if there will be a signing there... and I'm definitely considering it. The Ocean at the End of the Lane will have just come out in paperback, and The Truth is a Cave In The Black Mountains graphic novel will just have come out.... It's definitely possible. The new house in the woods is wonderful, and I'm enjoying getting to know the whole new world of the Hudson Valley. And the old house back in the Midwest is still there, and it still has my books on the shelves and my art on the walls and my bed, and I suspect I'm going to wind up dividing my time between both places, as much as I succeed in living in any one place. I have a wife who also seems determined to have a bi-locational existence, only with Melbourne, Australia and New York City as her two places that she spends her life. We'll figure it out. As long as I get a desk to write at, and a view of trees, I'm happy. Let's see. I'll probably forget a few things I meant to mention here. I interviewed Stoya in the Oyster Magazine (she is seen here being Death at a Dr Sketchy's). 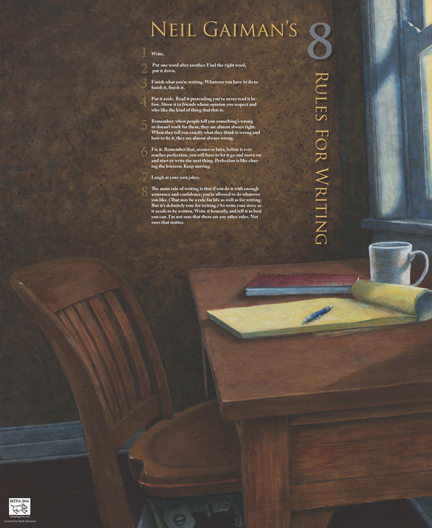 Biting Dog Press are releasing a limited print in June of 500 copies of my "8 Rules For Writing". You can't buy them retail -- they will be going directly to bookshops -- but Dave of Biting Dog is releasing 50 of them to the public directly as incentives to fund his daughter Kayla's Elephant Sanctuary Volunteer Trip: details at http://www.bitingdogpress.com/Merchandise/orderpage.html. I was thrilled to see that James Herbert will have a horror writing prize named after him. Jim is much missed, and this can only help to make sure that his name remains in people's minds. A photo Amanda took of me last night. She calls it "Schrödinger's Door." ...which is a photo I stole from Sam Eades's Twitter Feed. (So I think we can safely assume the aquamarine nail-varnished thumbnail is Sam's.) Sam was the publicist at Headline all through Ocean. She's amazing -- cheerful, sensible, a delight to be around, and the kind of person who can come up with a mad idea like getting a road named after a book and just make it happen while being on a signing tour like no other, and still getting the author fed. 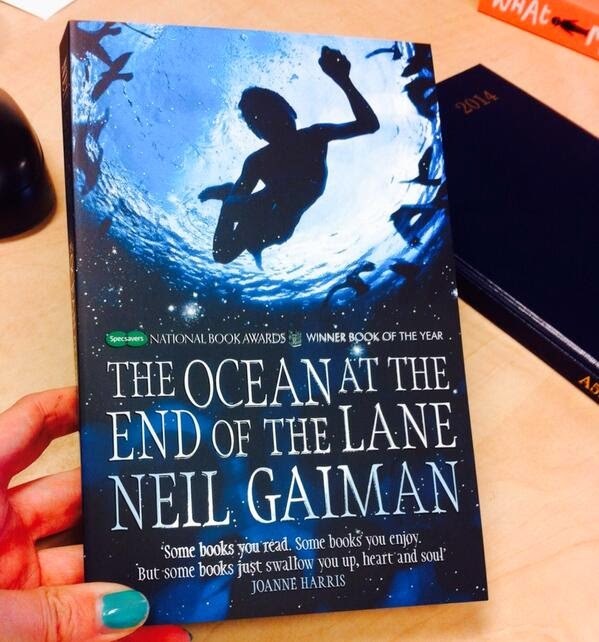 It's the UK paperback cover of THE OCEAN AT THE END OF THE LANE. The paperback comes out in a week. 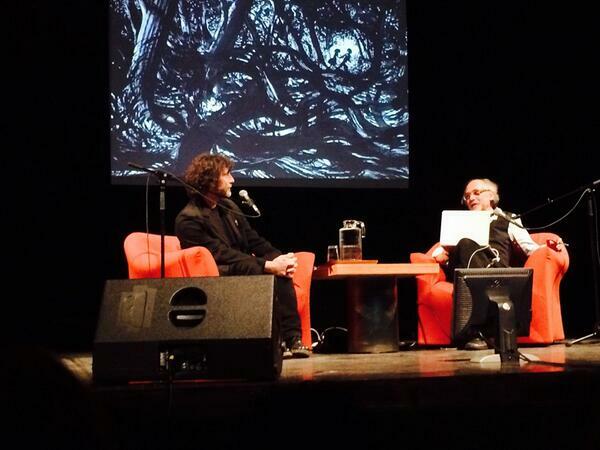 And then I thought, I should remember what Stephen King told me, something I put into the Make Good Art talk and book. I should enjoy this. So, contrary to my vaguely worried nature, I am doing my very best to enjoy it. 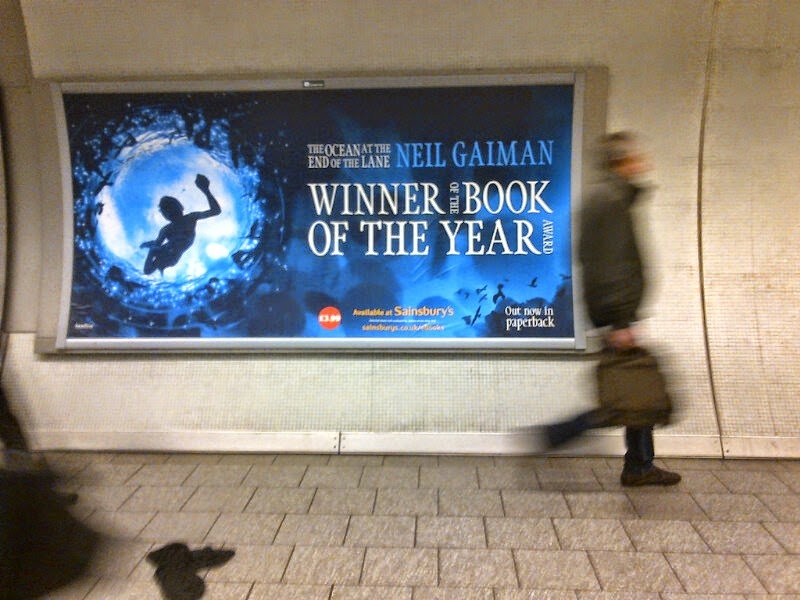 Book of the Year, twice, for two books. That's pretty good, isn't it? Manhattan, NY: A rare chance to join Art Spiegelman (class of '65) for coffee, carbs, and juice as he gives a personal guided tour of the 50' x 8' two-sided glass mural he designed for the school. Secrets-literally-behind the window will be revealed! And he'll have special guest Joost Swarte on hand, showing slides of his own stained glass windows in the Netherlands! The tour begins Sunday, April 6th, at 10:30 am, at the High School of Art and Design cafeteria, 5th floor. That's 245 East 56th Street, between 2nd and 3rd Avenues.Get your tickets here now! Tickets are $20, but $15 for those of you with a MoCCA pass, and free for current A&D students! Proceeds go to the Alumni Association to benefit the students of Art and Design. St Mark's Bookshop in New York has slowly become one of my favourite bookshops around, I think because it's so well curated. I never walk in there and think "So many books are being published. 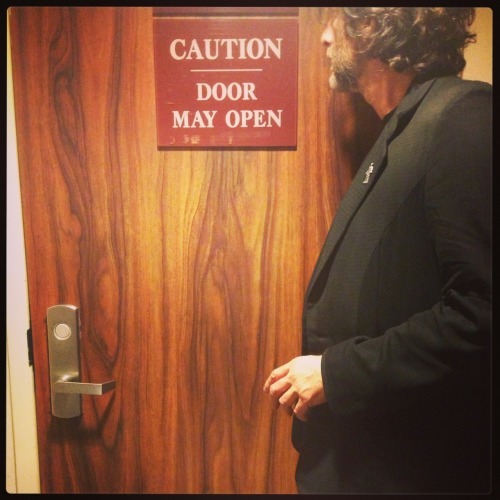 Why don't people just stop making new books and read the ones that are already out there?" which I sometimes find myself thinking on walking into huge chain bookshops. Instead I just walk around going "I didn't know that existed. I'll have that, and that, and that, and I'll get that for a friend...". Reminder: the Symphony Space "Selected Shorts" evening has sold out. It's a very strange process, moving into a new house. In my case, the worst of the moving in has been done. Now all that remains is details, hundreds upon hundreds of details. Details and details and details and, occasionally, small disasters. Yesterday, the heating stopped working. The heating stopped working because there was two inches of water in the cellar, because a water treatment pump could not keep up with the combination of rain and snowmelt that was already filling all the drains, and so backed up. I have good friends and they made everything okay, with pumps and knowledge of fixing things. I went into New York overnight, finished writing a very much overdue introduction in my hotel room, emailed it off moments before I fell asleep, had a Really Cool Secret Meeting this morning, and am typing this on the train back, the Hudson river grey and, on the far bank, distant leafless hills and cliffs. I want Spring to begin. I'm currently pondering whether or not to write a short story for a company. They've asked me to write one. I can write whatever I like, as long as I put their product in it and do not show their product killing people horribly, or even nicely. It would be a fun, interesting project that would pay well. To make things more interesting, I've already mentioned their product in a novel, I like their product, and I can see where the story would go. But I'm not sure. I'm going back and forth on it. I loved doing last year's project for BlackBerry, mostly because it felt like they were a patron of the arts. They gave me a very open brief ("What would you like to do on social media?") and let me go off and do it. They gave me a BlackBerry, and I promised I'd use it for a year. They made short films which I loved, about writing and inspiration and creation. (As a note here: when the year was up, I wanted to stay with BlackBerry as a phone platform. I really liked it, and kept finding myself frustrated when I'd use iPhones or Android phones, but I was grumpy about the lack of apps. They gave me a Z30. It's a wonderful phone (here's the USA Today write up.) But y'know, like they said in the USA Today review, no Yelp and no Netflix. But the BlackBerry project, while it was done for and with the assistance of BlackBerry, never meant I had to put a BlackBerry into a story. Which made me happy. Now I'm trying to figure out why that would have felt like crossing a line in the way that the Nokia phone (which, if I were writing it today, would be an iPhone) in the first chapter of American Gods does not. And what that line is. And why it troubles me. Getting ready for the Art Speigelman conversation at Bard on Friday. We plan to talk a whole lot. The Symphony Space "Selected Shorts" night on May 7th has now sold out. The only other event I'll be doing in New York this year is the Big One -- the Carnegie Hall event on June 27th. (You do not want to miss this: it's the same thing that sold out Sydney Opera House, with FourPlay String Quartet and me). Created for Sydney's renowned Graphic festival, this haunting tale of adventure, revenge and treasure, told as a hybrid between a storyteller, an artists and an Australian string quartet is playing five performances only - Carnegie Hall in New York, the Warfield in San Francisco, two sold-out shows at London's Barbican, all leading up to this very special night at Usher Hall. Here's the Usher Hall tickets link. Ayelet Waldman asked me if I could mention that she has a new book out, and I will, and not just because I have not yet written my speech for her daughter Rosie's Bat-Mitzvah: It is called Love and Treasure. That's the Amazon link, and here's the Indiebound. oops. This sat on my computer for 36 hours. In the meantime, Spring has definitely sprung. Deer are frisking through the woods and platoons of wild turkeys are self-importantly strutwaddling up and down the drive. I hope Spring heard me grumbling, and decided it was time to turn up.